The Beijing Railway Museum is overstocked with one-offs and prototypes and short on everyday working locos so it was good to get these two together on 16 March 2014. 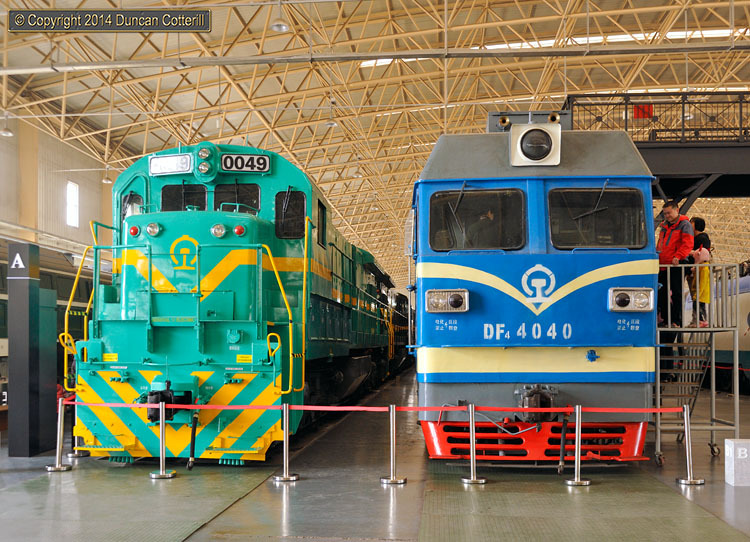 On the left, ND5 0049 was one of over 400 General Electric C36-7s supplied in the mid 1980s while DF4 4040 was one of over 800 DF4Cs built from 1989 to the late 1990s by Dalian, Datong, Sifang and Ziyang works in China. The ND5s were concentrated on a few key routes, such as Shenyang - Dalian, where they hauled freight, while the DF4Cs were much more widespread and, while mainly freight locos, also had some passenger work. DF4Cs are still at work as this is written in 2016 but the ND5s may now have been retired.